We wish to get You acquainted with Montagliari wine mansion, where are our house wines coming from. 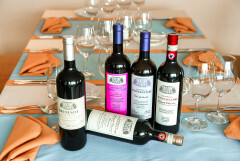 In autumn of 2012 paid restaurants “Bergfeldt” sommeliers a visit to Italy, Toscana, to find wines suitable with our Mediterranean a`la Carte menu. There we came across with wonderful little wine manufacturer Davide Migliorini, who is an enologist by profession. First acquaintance was made in June of 2010 on Italian Wine days in Haapsalu, where concortium of Cianti Classoco was invited to present their wines, among them also Fattoria Montagliari. By the way the town Greve located in Cianti Classico area is also Haapsalus twin town. Fattoria Montagliari, from where Fra Mare house wines are coming from manufactures mainly red wines and extra virgin olive oil. The whole work there is made by Davide`s big family consisting of his wife, children, a mother Bruna and brother’s family. The origin of the wine mansion is a bit unusual also for Italy. Davide says that he bought it on year 2000 from a man, who was not willing to leave the mansion to his son, because the son was not interested in wine manufacture; but this was the condition of an old man. So ended Davide, who had just graduated department of enology, and returned from the practise in America up with wine mansion. In addition of mansion he got land and wine cellars and all dignified mature wines in the cellars. 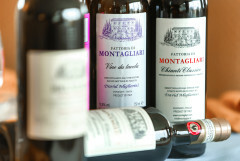 The wine cellars of Montagliari mansion contain imposingly big collection of wines from years 1962 until 1983, which all are certified by consortium of Cianti Classico. In ancient wine cellar is all necessary mechanics for traditional wine making, as well big amount of wood barrels, where the wine is being held. 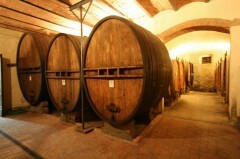 Part of the cellar is located underground and it is maintained like 300 years ago when it was built in 1700. The mansion works also as a hotel and a restaurant. All the rooms are with private bathrooms and are fully heated. 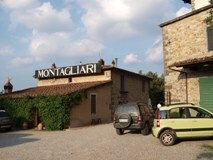 The Restaurant is run by Bruna ( Owner’s mother), a superb cook that will let you taste the traditional Tuscan cuisine with rustic dishes made with fresh ingredients and wines made exclusively from the Montagliari farm. Tha mansion has also its own shop, where You can purchase mansions local produce. The ways to spend one`s time in Montagliari are more than enough: in autumn You can participate in mansions works, as grape picking; in summer can one enjoy mansions historical beauty, wonderful cooking and charming nature on the outer terrace surrounded by trees, which are 100 years old. The Montagliari Farm is surrounded by 26 acres of vineyards, raised in Mixed Guyot Training System. The vine plants present are the ones typical of Chianti (Sangiovese, Canaiolo, Trebbiano, Malvasia). On 16 acres of land are olive groves, from which we manufacture high quality olive oil. 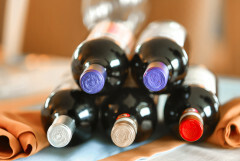 We hope that our choice of wines is also Your choice!